Sherry FitzGerald are delighted to present 93 St James Wood to the market. 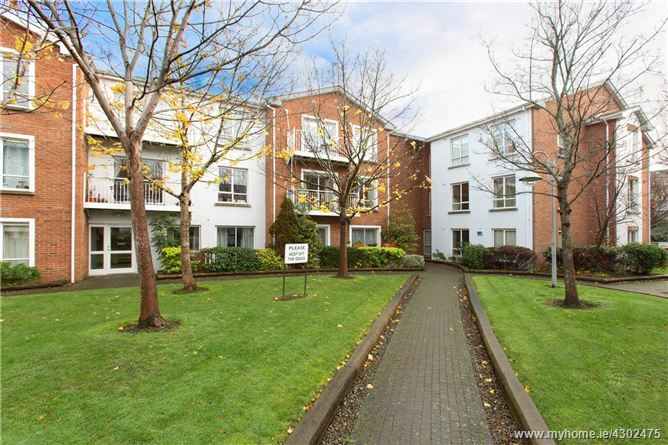 A wonderful opportunity to acquire a spacious three bedroom apartment with ample parking facilities, superbly positioned in this highly regarded Cosgrave built residential complex within close proximity to the city centre. St James Wood is a much sought after development enjoying a prime city centre location on South Circular Road with private access through electronic gates. The apartment offers well appointed, spacious accommodation throughout and comprises of entrance hall with large utility / storage room, living/dining with access to a balcony, a well equipped modern kitchen, three generous double bedrooms, one ensuite bathroom and a large family bathroom. The apartment is further complemented by landscaped communal gardens, communal car parking in either the over-ground or under-ground car parks along with bike storage areas. The Kilmainham area provides great facilities for everyday living including grocery stores, coffee shops, drycleaners and hairdressers along with the museums of Kilmainham Gaol and Irish Modern Museum of Art and the Phoenix Park. The location of the development offers the discerning purchaser great ease of access to the city centre which is just 2.5km's away along with the M50 and the Luas in St James Hospital or Suir Bridge. All in all a great apartment in a superb location. Early viewing is a must! Entrance Hall 1.86m x 6.01m. Laminate Flooring. Store Room. 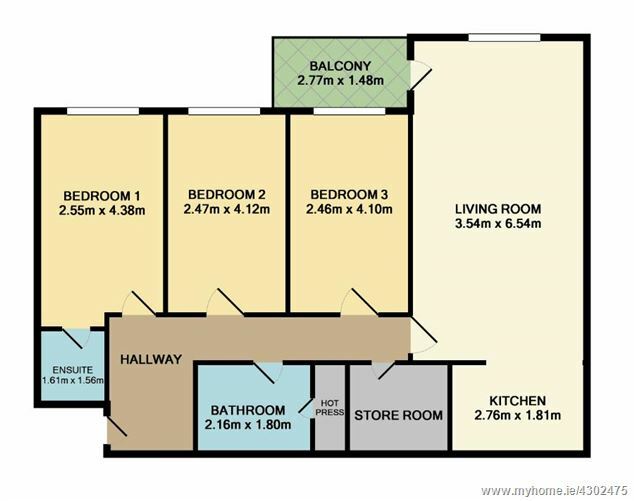 Living Room 3.54m x 6.54m. Carpet flooring & Feature fireplace. Kitchen 2.76m x 1.81m. Wall & Floor units. Tiled splashback. Integrated hob/oven & plumbed for washing machine. Bedroom 1 2.55m x 4.38m. Carpet Flooring. Fitted Wardrobe. 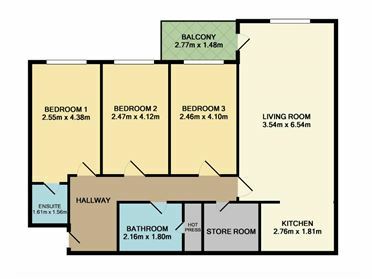 Bedroom 2 2.47m x 4.12m. Carpet Flooring. Fitted Wardrobe. Bedroom 3 2.46m x 4.10m. Carpet Flooring. Fitted Wardrobe. Bathroom 2.16m x 1.80m. Partly-tiled walls. Bath, wash-hand basin & hot press.